I don’t know how likely this is to ever happen again, so I’d like to share it with you. 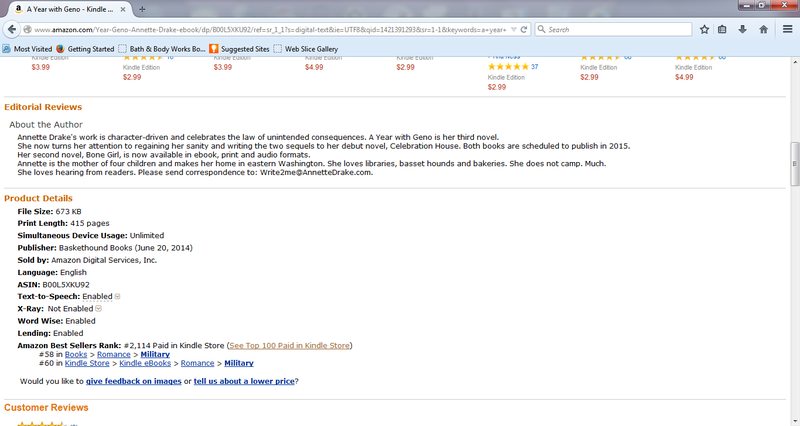 Today, after being featured on Ereader News Today and Indies Unlimited, my contemporary romance, A Year with Geno, has sold more than 225 copies, putting it at #58 and #60 in the military romance categories. This is the highest I’ve ever climbed in the Amazon rankings. My sincere gratitude to everyone who helped make this happen. Thank you! Congratulations! What a rewarding accomplishment! Thank you. Such a morale boost when I needed one.